Selwood will continue to hire pumps and pipework to Northumbrian Water for a minimum of three years. 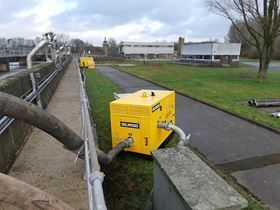 UK pump rental solutions supplier Selwood has won an exclusive contract to continue to hire pumps and pipework to Northumbrian Water for a minimum of three years. The contract, which comes with the option to extend for a further two years, has been awarded following a competitive tender process. “We are delighted to have won this contract to continue working with Northumbrian Water as valued partners,” said Richard Brown, managing director at Selwood. The new Birmingham facility is Selwood’s 20th pump rental centre. Selwood is one of the official sponsors of the Hull-timate Challenge. The UK’s Environment Agency awards Selwood a place on a new framework for its hired equipment requirements. Paul Marlow takes on the new role of Sales and International Rental Development Director at Selwood.